We are still shaking here in Tokyo. Sometimes it's us. Sometimes it's the ground. The aftershocks keep coming, continuing to unnerve people here. Thank you for praying. When the quake first occurred we knew it was severe, but had no idea as to the scope of things. I had been sneezing from spring hay fever and joked lightly that my sneezing just now was powerful enough to move the earth. Slowly, however, as information has come in the gravity of the situation has dawned on us and the nation. It is a truly awesome disaster. We would not wish this upon the country that we love, but God has some purposes even at this time. We rest in His arms. 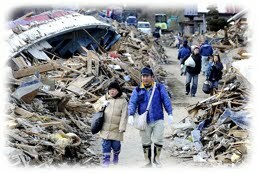 The quake has been revised to a 9.0 magnitude, the largest in Japan and fourth largest in recorded history. You need to see some of these photos to understand. They are absolutely apocalyptic. It is important to realize that this is, for the most part, these are more than 150 miles north of us. As if the massive quake, tsunami, dam breaks, and landslides didn't cause enough destruction, the nuclear powerplants along the coast are struggling to avoid a meltdown. We are also expecting some acid rain tomorrow from the massive fires at the oil refinery in Chiba. Due to the power plant disasters, the prime minister of Japan has just come on TV to tell of rolling blackouts from tomorrow (3/14). We are not sure if we will always be able to communicate with you (don't worry mom, we will be fine!). We have been warned that there is a 70% chance of a quake (aftershock?) of greater than 7 magnitude in the next few days. Water and gas (and internet) services are all working for us here in our neighborhood. This is not the case for all Tokyo. Many of our colleagues in ministry are roughing it. I was out earlier this afternoon to do some shopping. Although there is a little bit of panic buying (batteries, bread and some other staple items are sold out), for the most part there is plenty of food and water and everyday items. The atmosphere is solemn and quiet, but we also see some people having their hair done and eating out. Justen was at school at the moment of the earthquake. There was some slight damage to the building. Because the train system had come to a halt (large parts of it still are), the teachers tried to return kids by car, but quickly became stuck in the massive traffic jam caused by everyone having the same problem at once for more than 3 hours. Finally, one of the teachers stayed behind in the vehicle while another walked with the children -- a 3hour walk -- back to that teacher's home in Tokyo. There the kids spent a restless night with a few more adventures thrown in. Justen returned back home safely on Saturday. He was worn out in many ways (and so was his mom). In spite of all this, thirty people and ten kids gathered at our church plant, Denen Grace Chapel, this morning (3/13). I shared a message of hope from Psalm 23. We had a time of singing, prayer and communion. In the middle of communion twenty-some cell phones went off warning us that an aftershock was imminent. It was quite an unexpected special number! But the heart-warming scene that brought tears to this church planter's eyes was standing toward the back and listening as church members sang "Jesus, Loves Me." (I took a video of this and hope to post it soon.) Many of them were unsaved and unbaptized just a couple years ago. To see the change in their lives -- and now in the face of this devastating reality -- crumbled down the walls that stress had built over the past few days. The emotion welled up within me. It was all I could do to hold it down as I preached. 99% of Japanese are without the hope and eternal life Christ gives. We have prayed and sweated for this country's revival a long time. Could God be allowing an answer in this way? We will set up an account shortly to receive any gifts you would like to give specifically to these devastated churches/people. Kevin, Thank you for the updates! My family has been praying for yours and the people of Japan. Keep us posted on what we can do from the states!